If you are like me and likes using your nails as tools to pry open things in your daily life then it's little wonder that no nail lacquers (other than shellacs and UV gel nail colours) survive for long on my fingers. Usually within a day, even with the best of lacquer formulas, I'll experience tip wear (where the colour at the edge of the nail is fades off). The quality of the lacquer determines the extent it of the tip wear in a day. Then a few days later, the nail colour will normally lift on the edge and chip or lift off even with a protective top coat on. 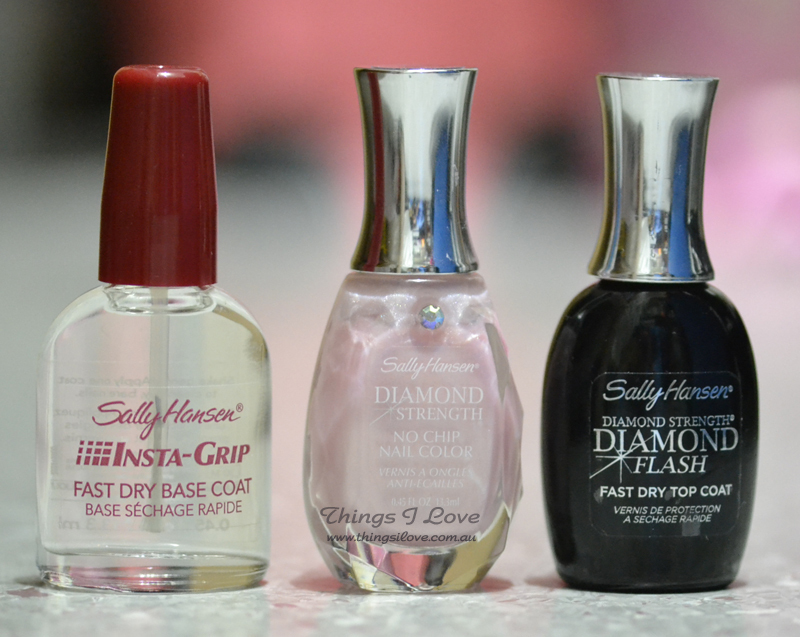 Recently, I tried out some nail products from Sally Hansens and have to say for my rough treatment of my hands, its stands up quite well to fading and chipping (actually I did not experience any chipping at all). The Insta- Grip base coat is quick drying and creates a slightly non-smooth surface on the nail bed for the colour to stick to and also prevents yellowing of nail beds while strengthening it. The only thing I did notice is that if applied too thickly, the colour can peel after a couple of days with this base coat on, so be sure to paint it on as thinly as possible to avoid this issue. The selection of growing shades from the Diamond Strength No-Chip nail color with diamond particles for long wear range from the wearable pastels to the contemporary and modern with an easy to apply fluid formula and brush. The shade I have on in the picture is #220 Champagne Toast, a pastel pink with fine iridescent shimmer and a pearl finish. It is a soft pretty shade that is easy to co-ordinate clothing and accessories with. 3 coats were needed on this shade to get a more opaque finish. The Diamond Strength Diamond Flash top coat featuring grounded diamond particles is one of my favourite nail finishing product as not only does it creates a mirror-like shine to nails, is is quick-drying (60 secs touch dry) and prolongs the intensity and wear of nail colours by doubling its life on my nails. That means that I get about 4 days of wear without tip fade and over a week wear without chipping. The nail colour lasts even longer when I re-apply the top coat every 2nd day to further protect it from fading and to give it an instant boost in shine. Sally Hansen has come to my rescue and I can now make any of my manicures last over a week with the help of some of its clever products. Now I just need to make the nail lacquers dry faster so I don't accidently smudge them when they are touch dry but not completely set yet. Do you have any products you can recommend me to avoid nail smudges after application? at pharmacies, Target, David Jones, Myer, K-mart and Woolworths. I would highly recommend drip dry from opi to fast track your drying efforts! @Pravenna - looks like I'll have to visit the OPI counter soon. Thanks for the rec.